← A walk along the Coffin Road in search of inspiration. Hello, here’s my table last night, nothing has changed this morning except these are now covered with polythene to dry slowly. 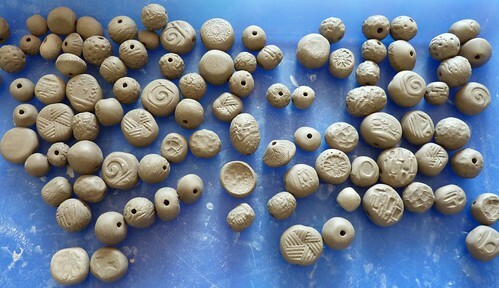 I have been working with clay recently, hand building succulent planters, and some more ceramic beads as I’m running out of stock. Clay has to be the messiest medium, and I’m the messiest worker, and I know you paper crafts people are very neat and tidy . Feeling a tad ashamed over the state of my studio I spent yesterday morning cleaning up my mess in order to get some photos that I felt I could share. Here are a few closeups, there are planters of all sizes, I have had so many folks commenting on the large planter I made for myself I thought I needed a range to suit everyone. Some have a slightly domed top, they remind me of flying saucers. The large planter was quite a struggle but in the end I’m happy with it, let’s hope it fires well. I made a little egg shaped pot, maybe a planter but it would work for lots of other uses too. 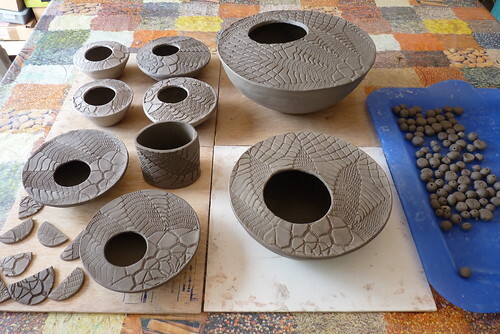 I love making ceramic beads, I love the feel of the clay when rolling it into balls, and choosing the glazes, but my favourite part ( which makes me feel like a girl again) is putting them together in mixed sets. I can spend quite a bit of time doing this, just playing with the beads. This entry was posted in kiln fired art and tagged #WOYWW, ceramics, clay beads, hand built pots, kiln fired art, succulent planters. Bookmark the permalink. No, we love to see mess, no need to tidy up on our behalf!! 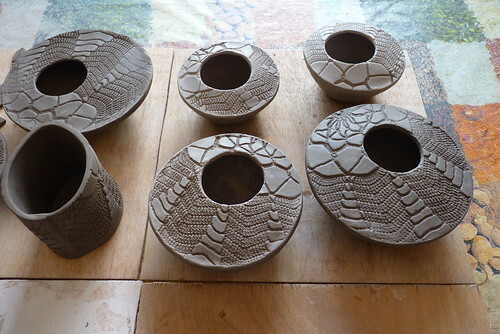 I do love the shape of those planters, also the abstract design stamped into the top,and the offset hole. Really fab, love them!! 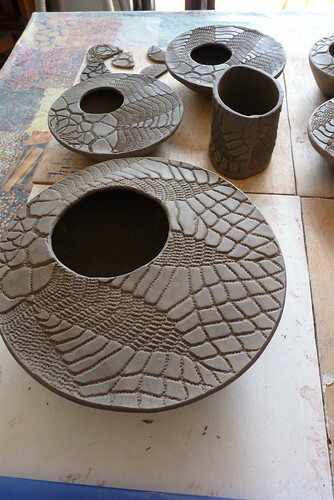 Beautiful set of planters and never worry about mess we all make it when the creative energy is in full swing. I love your planters! The textures are wonderful! I so love the planters! Those are really beautiful. Love the beads too. I am truly mesmerized just looking at your wonderful creations, promise us that you will show your creating area as is and not tidy up? You’re only human just like us and mess is good. They look beautiful I’m sure you’ll have to make some more as everyone will want one.